Question – asked by Glenn Arthur representing the Diving community – can divers be allowed to do their diving activity by the windmills? Answer – No problem, diving activity is not restricted by the windmills. Questions – by John Toth, representing the Jersey Coast Anglers Association (JCAA) and the New Jersey Outdoor Alliance (NJOA) – Can anglers be allowed to fish by the windmills? Also, as a follow up question – Do you see this access being restricted in the event of terrorist activity; possibly resulting with all access restricted and resulting (as an unintended consequence) in the creation of a Marine Protected Area (MPA)? Answer- Anglers will be allowed to fish by the windmills. In regard to terrorist activity, the developers do not see this type of activity happening since there are so much better targets on land that would be far more effective in causing mayhem, such as bombing subways that a lot of people use. Note: The offshore windmills in European waters do not allow any types of fishing by them with the exception of England that allows them. Question – Have developers researched other forms of energy production alternatives besides windmills such as energy that can be produced by harnessing the motion of waves. Answer – No, but it is an interesting concept and may be developed as an alternate energy source in the future. Question – These windmills have a projected lifespan of 20 to 25 years and what are your plans to decommission them? Will you just leave them at their locations when they are not producing ay energy? Answer – the developers intend to remove them. They will have a bond in their contracts to pay for their removal. (Interestingly, there were some comments made to keep them at their location even when they are past their energy production so that they still could be used as artificial reefs!) These unproductive windmills could become navigation hazards and the commercial fishing industry would want them removed. Questions – By Bob Rush (member of New Jersey’s Marine Fishery Council who spoke on his behalf and not on the Council) – Why has there not been more science introduced to first answer the negative effects that these windmills can cause with fish migration patterns, whale activity, electromagnetic effects of the cables on fish life. It seems to me “that we are building the windmills first, and then figuring out later the negative drawbacks that they pose on marine life”. Answer- An Environmental Impact Study (EIS) is being conducted presently to review possible negative impacts that the windmills can have on marine life. They will cover the effects of noise generated by the installation of the windmills by pile driving (that may have to stop when whales are located nearby) and the effects of the cables (that will be buried seven (7) feet underground). Presently, this EIS is in progress, but final results have not been concluded and there is not a projected time when it will be concluded. Question – What kind of security will be provided by the windmills? – Answer – the Developers do not have any plans to provide security. They indicated that most likely, the US Coast Guard would provide it. Question – Will the windmills be able to withstand the hurricanes the USA has almost on annual basis and storms like we had with Sandy? Answer – We have put up thousands of windmills and we have not lost any of them, especially the ones in or by the North Sea near Denmark. The North Sea is very rough on many sailing vessels. Question – How much will taxpayer have to subsidize these windmills? Answer – this subject is not part of this forum. It will be addressed at future windmill meetings. Unfortunately, time did not allow me to ask other questions that I would like to have answered. Windmills are planned to be placed on productive scallop and clam grounds. The commercial industry plans litigation to prevent this from happening and, consequently, this litigation will possibly delay implementation of the windmill project. I want to know if there any plans to change the location of these windmills. Why should we lose a valuable food source when these windmills can be placed in another location? I plan to attend future windmill meetings and keep you informed of all the latest developments of this huge project that will affect all of us NJ residents. On October 18th, I and about 40 other recreational anglers attended a meeting at the Langosta Lounge in Asbury Park to hear presentations on windmills by Zach Cockrun, Director of Conservation Partnerships for the National Federation of Wildlife, and Captain Dave Monti, a Rhode Island charter captain who is very familiar with the operation of the five windmills currently in place at Block Island. These presentations, unlike the two others I attended on July 9th and September 30th, were geared just for recreational anglers so that we could better understand this huge windmill project that will be in New Jersey’s waters in the near future. I took notes of this meeting and after a few days, I sent an email to Zach Cockrun asking him questions as follow up to it. Question - On one of the boards, there was a statement that anglers have guaranteed access to the windmills. Who is the guarantor for this access? Does it cover all of the windmills since there are a number of developers for different windmill locations? Will we see a signed document to this effect? Answer - Every developer we have spoken to has said they will not restrict access. As far as I know most are on public record, but it is a good reason to show up to hearings to get them to say it on record. BOEM and the Coast Guard have also said they don’t have plans to enforce access restrictions outside of construction. We’re trying to find the best mechanism for getting it in writing, but would also be happy to look into meeting with NJ officials to express access concerns. Question - “Nothing has been set in stone” is the phrase we have been hearing, but is the scallop/clammer sites still set to have windmills on them? If this happens, not only will the commercial fishermen be put out of business, but we will be also destroying prime areas that produce this food source we consume. The ocean is vast and can these windmills be moved to alternate locations? Given the talk about compensation to commercial anglers, it seems to me that the decision to put windmills on these sites has already been determined. Is that true? Answer - Siting the windmills is dependent on a variety of factors – bottom type, navigation, wildlife impacts, and avoiding, when possible, fishing grounds. Conflicts with scallopers is definitely still a possibility despite efforts to minimize those conflicts. In the case of the Vineyard Wind project in MA, the developer worked with scallopers to change the layout of the wind farm to improve their ability to operate in the area. They are reducing the number of turbines, and changing the direction of the arrangement as well as adding a 4 mile transit zone through the middle. Finally, they are likely to increase the distance to 1 mile between each turbine to help gear move through the wind farm area. Even all of that said, mitigation will likely be necessary as there will still be impacts. However, I think it is very unlikely that even numerous wind farms lead to the end of this industry. Question -These questions are more for confirmation purposes – there will be about 400 windmills deployed, they will be about 460 feet in height, and once they are all deployed, how many homes are they expected to illuminate? Also, will the energy produced by them be solely used by New Jersey residents or will the energy be sent to other states? Also, what will be the length/width of one blade? Answer - A 3,500 mw commitment is between about 350 and 580 turbines, depending on technology. Current offshore wind turbines are 6MW each and would need more. I think it is more likely by the time the first wind farm in NJ gets developed that turbines will be 8-10MW and require fewer. They are approximately 300 feet to the turbine hub. A blade is Approximately 225 feet long. So a blade at the peak will make the entire structure 525 feet tall. 3,500 mws of offshore wind power will power at least 1.1 million homes. This is a conservative estimate. The power is being purchased by New Jersey to meet its renewable energy goals. Question – The windmills are expected to supply 3,500 megawatts by 2030. Is this four times the future energy needs of our state as I have written in my notes? Answer-The total potential generation of offshore wind from Maine to North Carolina could meet 4 times the country’s energy demand. It is not realistic that we would build this much offshore windmills, but we say it to point out how big the potential for energy generation is. Only a fraction of that can meet the needs of coastal states in the Northeast and Mid Atlantic. Question - What is the total area of the ocean that these windmills will cover including the spaces between them? In regard to this spacing, will it be enough for commercial boats to navigate through them? Answer- The development farthest along will be between .8 and 1 nm apart – more than enough for commercial traffic. They also are including a transit lane 4 miles wild for ships moving through the wind farm. By that standard, a 100 turbine farm, which would be an approximately 800mw project powering 250,000 homes would likely be around 100 square miles (not including transit zone). Question - Captain Monti indicated that the 5 windmills by Block Island are not disrupting fish migrations etc. But his chart also indicated that the effects of multiple windmills (400) are not known. This is an issue of concern since anchoring this number of windmills will produce noise, the rotating blades will make noise, the cables will give off electro-magnetic effects, and the installation of the cables disrupting the ocean bottom will all have a negative effect on whales and other fishery migration patterns and also their habitats. Placing cables on the ocean floor for so many windmills will really tear it up and most certainly have a negative effect on a multitude of fisheries. Migrating birds, with this number of windmills, can also have the potential of being killed by them. Is there an environmental impact study in progress or planned in the near future to address these issues? Answer- Yes. Each project will have to undergo an Environmental Impact Statement (EIS). Once produced, we can comment on the EIS to recommend other areas of study if things were missed. One of the key elements of an EIS is it includes what are known as “cumulative impacts” – the idea is to assess impacts of the entire industry. So the first project will assess impacts of the planned 100 turbines. The second project will assess impacts of that project PLUS any existing projects. The idea is that as we slowly build these out over the next few years, we will learn more in ways that could inform how, when and where we build specific projects. Question - We all know the corrosive nature of salt on everything and windmills will be exposed to salt 24/7. These windmills are supposed to have a lifetime of 25 years and the corrosive nature of salt can significantly reduce this lifetime. I remember you saying the developers must be bonded so that they can absorb financial losses due to this type of problem. Will this bond not only cover losses for unexpected maintenance issues, refurbishments of blades or even a total loss due to destruction by a storm like Sandy? Answer- The engineering behind these turbines is incredible. They are built to withstand direct hits from category III hurricanes – much bigger than Sandy. The 25 year lifetime is a reasonable estimate. We just witnessed the first decommissioning of a wind farm that was built in 2001 in the UK. The firm decommissioned them because the units were not big enough to justify ongoing maintenance costs. That makes sense because they were first generation technology.The bond wouldn’t cover maintenance issues, but these firms know how to run wind farms. Orsted, one of the lease holders in NJ operates more than 1000 turbines across the world and knows what the maintenance costs will be for these farms. FYI -At another windmill meeting on September 20th in Long Branch, BOEM representatives seemed to be receptive to having developers in the process of installing windmills to remove phantom cables lying on the ocean floor that have broken off commercial boats and are a big nuisance to all ocean vessels. You may want to consider this task as part of the Scope of Work for future developers. Answer- We’ certainly be willing to look into this! In regard to meeting with New Jersey officials as Zach indicated in his answer to me about guaranteed access, I plan to contact individuals in our recreational community who can assist us in trying to have this access guaranteed. On July 9th, I attended a meeting in the Municipal Building at Belmar hosted by the NJ DEP and the Bureau of Energy Management (BOEM), a federal agency that is involved in determining windmill placements. Both of these agencies explained that Governor Phil Murphy issued an Executive Order mandating that he wants to see 3,500 Megawatts of energy produced by windmills off New Jersey’s coast by 2030. These windmills would be placed in federal waters approximately 17 miles off New Jersey’s coast. NJ’s Bureau of Public Energy (BPU) would interface with potential developers in the leasing process, and the NJ DEP would focus on environmental issues involved in setting up these windmills. For recreational anglers, there are two major concerns with these windmills and they are: we do not want them to be placed on prime fishing locations – and we want to be able to fish by them when they become operational. The concern is that these windmills can be like Earle Pier and we would get chased away by security guards if we get to close to them. We were told that we would be able to fish by them, but do we really know for sure? In Europe that has extensive windmill development and with the exception of England, all other European countries ban fishing by their windmills. In regard to prime fishing grounds, we will have to further review their recommended locations to determine if windmills should be placed on them. BOEM showed four locations under consideration for these windmills: Fairways North, Fairways South, Hudson North and Hudson South. These locations were strongly criticized by commercial fishermen in the audience since they are in the areas they fish, especially for scallops and clams. They said that they would eventually be put out of business. In response to that, a BOEM representative indicated that a fund could be established to compensate commercial anglers for loss of their fishing business! I don’t think any of us would like to be told that a new project will put us out of business! A number of commercial fishermen and their families have been in the fishing business for generations and now they hear that they will be the casualties of these new windmills. I asked BOEM how many windmills they envision being built and the answer I got is that they don’t know. I also indicated that a couple of years ago, Clean Ocean Action (COA) made a big fuss about seismic testing by one boat and the blasts it produced, harming whales and other species in their migratory patterns. Drilling the ocean bottom to establish pylons for windmill foundations will most certainly make a lot of noise to vastly exceed anything done by one boat doing seismic testing. The BOEM representative conceded that this is a major concern since it would especially affect whales. However, they are looking at way to reduce this harmful effect. A question was raised from the commercial anglers about the projected lifespan of these new windmills. The BOEM representative indicated that these windmills will have a lifespan of 25 years. This answer caused quite a stir among the crowd with someone yelling “They won’t last that long with corrosive salt water. Don’t you people know that these windmills will be in the ocean”! Another person asked “Who is going to monitor the operation of these windmills so that potential problems with them can be easily rectified such as broken wind blades? The BOEM response was that they will resolve that issue in the near future. Giant Sea Gate Proposed off Sandy Hook – Can it Work? Federal officials are considering building a 5-mile sea barrier stretching from Sandy Hook to Queens to protect northern New Jersey and New York from devastating storm surges - a proposal that has drawn overwhelming criticism, especially environmental advocates. This proposal is one of six considered by the U.S. Army Corps of Engineers when a 12 foot storm inundated lower Manhattan. This proposal is in its infancy and that the cost, how large it would be and what materials would be used to build it still need to be developed. Although other states and countries use such barriers, this 5-mile barrier would change fish migrations, affecting the recreational and commercial industry which generates about 2.5 billion annually in economic activity. This 5-mile barrier would begin from Sandy Hook in Monmouth County to Breezy Point in Queens that would be designed to keep storm surges from entering New York harbor, the Hudson River, Newark Bay, the Hackensack River and Raritan Bay. It would allow passage for ships via gates. There are a number of problems associated with this barrier including shutting off the tidal system which brings in oxygen and nutrients into our shores. Our estuaries essentially become alike a stagnant lake. More importantly, if this barrier was in place and was hit by a huge surge, where would the surge water go? It would go to one or both ends of the barrier and then hit the communities at the ends of this barrier. So, what good does that do! The other proposals use barriers also, but it looks like the U.S. Army Corps of Engineers need to go back to the drawing boards! Cities and nations are looking at banning plastic straws and stirrers in the hope of addressing the world’s plastic pollution problem. The problem is so large that scientists say that is not nearly enough. Australian scientists (Denise Hardesty & Chris Wilcox) using trash collected on U.S. coastlines during clean ups over five years estimate that there are 7.5 million plastic straws laying around America’s shorelines. They also figure means as many as 8.3 billion plastic straws are on the world’s coastlines. 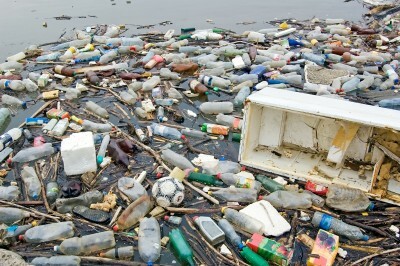 That number is small when you look at all the plastic bobbing around oceans. A University environmental professor from Georgia (Jenna Jambeck) calculates that nearly 9 million tons of plastic end up in the world’s oceans and coastlines each year. “For every pound of tuna we’re taking out of the ocean, we’re putting 2 pounds of plastic in the ocean”, says Sherry Lippiat, a California regional coordinator for NOAA. Sea birds can ingest as much as 8 percent of their body weight in plastic, which for humans “is equivalent to the average woman having the weight of two babies in her stomach”, says members of the Australia’s Scientific and Industrial Research Organization. The United Kingdom announced plans on April 19, 2018 to ban the sale of plastic straws, stirrers and cotton swabs as the global war against plastic gains momentum. As many as 1 million birds and 100,000 sea mammals die every year ingesting some of the world’s 150 million tons of plastic in the world’s oceans, advocates say. The proposed ban comes as British Prime Minister, Theresa May hosts Commonwealth leaders at a summit from 53 nations. (Asbury Park Press, April 20 & 22 editions). After the huge tsunami damaged Japan six years ago, it also unleashed a very different threat onto the coastline of North America, a massive invasion of marine life from across the Pacific Ocean. Hundreds of species from the coastal waters of Japan-mostly invertebrates like mussels, sea anemones and crabs – were carried across the Pacific on huge amounts of floating fishing debris. The first piece of wreckage began washing up on the shores of Canada and then the United states. To the surprise of scientists, this debris was covered with sea creatures that had survived crossings that in some cases had taken years! It is too early too early to tell how many of these invaders have gained a foothold in North American waters where they could challenge or even replace native species. While such “rafting” of animals across oceans happened in the past, scientists say that this Japanese tsunami is unprecedented due to the sheer numbers of organisms that it sent across the world’s largest ocean. While there was a concern that this debris was contaminated with nuclear waste, that fear proved to be infounded. Such large numbers of marine animals were able to cross the Pacific because they rode on debris like plastic and fiberglass – that proved durable enough to drift thousands of miles. These synthetics can stay afloat for years or even decades. This floating material ranged in size from coolers and motorcycle helmets to entire fishing boats, teeming with living sea animals that are native to Japan, but foreign to North America. One that first appeared was a 180-ton floating dock that washed ashore in Oregon in June 2012. It is remarkable that that such wide range of species could survive the journey across the Pacific and were even able to reproduce, in some cases, at least three generations before reaching our shores! Approximately 634 pieces washed up to our shores and they carried about 239 invasive species! With rising sea waters, this “rafting’ of invasive sea creatures on so much debris in our oceans can become more common and also very injurious to the eco-systems of many countries. (NY Times, September 29, 2017). Background - Super Storm Sandy damaged/destroyed so much of our beaches and now coastal communities want sand to bring their beaches back to what they were pre-Sandy. Beach replenishment has been an ongoing process when storms periodically hit our beaches, but the beaches now need a lot of it because of Sandy. The Manasquan Inlet to Barnegat Inlet Coastal Storm Reduction Project calls for beach fill construction along the oceanfront between Point Pleasant Beach, and the northern boundary of Island Beach State Park. This project calls for using sand from offshore sources for 50 years! Project cost - $513.9 million! Where to Get the Sand Needed for this huge project? - The Army Corps of Engineers (Corps) has its present focus on the Manasquan Ridge which was formed perhaps hundreds/thousands of years ago (the last Ice Age?). This ridge is the home of numerous sand eels and other species that attract all types of fish that is targeted by both recreational and commercial fishing. In 2014, commercial fishermen netted $4.8 million worth of summer flounder on the wholesale market according to NOAA. The Manasquan Ridge is huge, about 1,700 acres or 1,500 football fields, and it has underwater sand hills that rise about 20 feet off the bottom. There are also a few shipwrecks and rock ledges on it. The Corps maintains that there are not many economically viable land sources of sand for the large quantities needed for these replenishment projects. This ridge's sand is also the right texture for the Corp's use. It has 38.6 million cubic yards of suitable beach fill material. The Corps would like to take sand from this ridge (and others) since it is a big pile of sand and makes their job easier to pick up this sand and the cost to do it less than looking for it elsewhere. Not all of the ocean floor has sand on it. Conflict - Fishermen have been weary with the Corps over this ridge and others nearby, which they depend upon to hold fish. They are still bitter over the Corps use of nearly half of the Harvey Cedar Lump for the Long Beach Island to Little Egg Harbor Inlet beach replenishment project. The coastal communities want this sand to restore their beaches, especially for the tourism industry. The Corps does not unilaterally act on its own to remove this sand, but acts on the direction provided by our NJ Department of Environmental Protection in concert with federal agencies like the Bureau of Ocean Energy Management (BOEM) since this ridge is in federal waters. The NJ DEP has given its approval for this project that may begin as early as next year. At this point, BOEM has not and it is waiting for the NJ DEP to submit a formal application to do so.  While it was not the intention of the NJ DEP to disrupt productive fishing areas, the fishing community should have been invited to review the DEP’s plans for sand removal before it began.  Options other than taking sand from the Manasquan Ridge and others like it included - taking sand from areas where it is has been concentrating due to the normal washing away from the beaches (in the Wildwood area or other locations like it) or even from areas close to beaches that have unusual buildup from sand that washes away from the nearby shores - taking it from one of the ridges that is not that productive for fishing (lesser of two evils) - and taking sand that has been dredged from inlets and then usually dumped not far away them.  The Corps will not stop doing beach replenishment due to the existing contracts that it has with the DEP. However, the NJ DEP staff will do a comprehensive review of alternate locations that sand can be taken from to lessen their impacts on our prime fishing areas. When this review is completed, the NJ DEP will invite us to another meeting to review their findings. This meeting was constructive in that solutions were being offered to mitigate the problems created by beach replenishment. I will keep you updated as this sand mining issue unfolds. On behalf of the Jersey Coast Anglers Association(JCAA) and the New Jersey Outdoor Alliance (NJOA), and our club, I attended a presentation given by Mr. Rik van Hemmen who is proposing to implement a Sandy Hook Bay Natural Marine Sanctuary. It would stretch roughly from Sandy Hook to the Earle Naval pier and to parts of the Navesink and the Schrewsbury rivers. This presentation was given at the Red Bank library at 7:00 p.m. on March 16th and it was attended by approximately 200-250 angry recreational anglers, commercial fishermen, oyster harvesters, clammers, and waterfowlers. Only about 60 could fit in the conference room and the rest waited outside the library. This turnout was due to the threat that this sanctuary would have on one of our most productive fishing grounds for both recreational and commercial anglers. Mr. Hemmen started his presentation by showing us a bunch of pictures of this area with boats and birds, but nothing concrete about WHY it should be a sanctuary. He did not stress any positive results we would expect to receive by having this sanctuary. He seems to love the area in question, but is oblivious to the repercussions that would result by having a sanctuary. In fact, Mr. Dan Ferrigno, a former and retired staff member of our NJ DEP with 30 years of experience, remarked that the sanctuaries we now have around our country (about 5 of them) all end up with tough restrictions on fishing, boating, jet skis and diminish the enjoyment people should receive by having them. Others in the audience voiced over and over again that this sanctuary status would lead to more fishing restrictions and that we do not need more regulations! Hemmen responded that he is not trying to impose these regulations, but he seemed oblivious to this major concern voiced by the audience. One person told him that he lives by the affected area and that the waters are cleaner than they have ever been and have more fish and that he did not see a need for this sanctuary, but Hemmen just blew off this remark. Building on this no need for a sanctuary, I remarked that "you obviously love the sanctuary concept to keep things the way they are for you, but YOU HAVE NOT MADE A CASE WHY WE SHOULD HAVE IT! He responded that "we will have more fish"! One person yelled out "do you have the data to prove it" and he said that he did not! His answer to me like the one he made earlier about a trash problem seems to be made up as he goes along with his presentation since he has no real answers to the important questions raised about his sanctuary proposal. My take on this sanctuary issue is that Hemmen does not understand the negative implications that a sanctuary has, but worse is that he is not accepting the comments that were mostly made by anglers in the room. The danger I see is that in spite of what was conveyed to him about restrictions, he will still go forward with this sanctuary and, of course, like- minded organizations may back him and this can gain traction to move it further. For this sanctuary to go to higher levels in our federal government it has to be first approved by our state government and that is our best hope to stop it. I will carefully track the sanctuary issue and keep you updated. We all need to stay on top of this important issue and all be united against it! Be Careful Which Fish You Choose to Eat - Skip Tilapia! In a December 22nd article in the Asbury Park Press, the author (Samantha Davis) writes a "Healthy Living " column and tells how to better our health. She tells us to eat wild salmon instead of farm raised because the fishmeal they use to combat parasites and disease in farm-raised commercial salmon has antibiotics and high levels of PCBs. One of the best fish to eat is sardines since they contain a lot of omega-3 and one of the few foods naturally containing Vitamin D. But, she also indicates that tilapia, one of America's most popular fish should be avoided. According to the National Fisheries Institute, this freshwater fish has become the fourth most eaten fish in the U.S.! Tilapia is always farm-raised, and often imported from China that has an abysmal record for food safety. Farmed raised tilapia has a high inflammatory potential, which could lead to heart disease, asthma, and joint problems. Researches from Wake Forest University have found that tilapia has a higher inflammatory potential than that of a hamburger or pork bacon! Not all fish is healthy to eat, only the right ones! Genetically Engineered Salmon Declared Ready for US Plates! On November 19th, the Food and Drug Administration (FDA) approved a genetically engineered salmon as fit for consumption, making it the first genetically altered animal to be cleared for American supermarkets and dinner plates. The approval by the FDA caps a long struggle by AquaBounty Technologies, a small company that first approached the FDA about approval in the 1990's. The FDA said the approval process took so long because it was the first of its kind. The approval of this salmon has been fiercely opposed by consumer and environmental groups, which have argued that the safety studies were inadequate and that wild salmon populations might be affected if the engineered fish were to escape into the oceans and rivers. "This unfortunate, historic decision, disregards the vast majority of consumers, many independent scientists, numerous members of Congress and salmon growers around the world, who have voiced strong opposition" said Wenonah Hauter, Executive Director, Food and Water Watch. Within hours of the FDA's decision, a consumer advocacy group, Center for Food Safety, said it and other organizations would file a lawsuit challenging the FDA approval. The AquaAdvantage salmon, as it is known, is an Atlantic salmon that has been genetically modified so that it grows to market size faster than a non-genetically salmon in as little as half the time. Despite the FDA approval, it is likely to be at least two years before any of the salmon reaches the market. It is also not likely that much of this salmon will be on the market because this company's production facility is relatively small and it is located in Panama. FDA officials said that the salmon would NOT have to be labeled as genetically engineered. However, it issued draft guidance as to wording that companies could use to VOLUNTARILY label the salmon as genetically engineered or to label other salmon as not genetically engineered. This genetically engineered salmon represents a debate between one group that wants nature to take its natural course in the production of food and the harvesting of animals. The other group wants science through genetically engineering to improve food and the harvesting of animals. For example, scientists in China have recently created goats with more muscle and hair. This debate between these two groups is far from over! (NY Times, November 20, 2015). 1. The proposed LNG port will be located at the Gateway to the NY/NJ harbor, approximately 18 miles off Long Island and 28 miles off New Jersey. This is a highly trafficked area with thousands of boats and ships moving into and out of the New York/ New Jersey marine facilities. Under these conditions, the LNG port can pose a serious hazard to the navigation of the many ships large and small that use this important waterway system. 2. As we all know, Super Storm Sandy caused tremendous damage with waves nearly 30 feet high. Acting on warnings to this approaching storm, ships moved to different locations to avoid this super storm or took actions to better secure their craft. A storm like Sandy can come again and can the LNG port be adequately secured from the effect of this type of storm? If not, it will be tossed into the ocean with devastating economic effects on our entire region, including loss of life. 3. Exclusion zones will extend two miles from each docking buoy, eliminating the ability of fishing vessels to access or anchor in the affected area. Commercial and recreational fishermen will be excluded from these important fishing grounds. Anglers are excluded similarly from the present Earle naval fishing port and are chased away by inadvertently entering it. While it is needed for security of the naval vessels being repaired there, it is a nuisance for anglers and one that we do not want to experience again by the proposed LNG port. 4. A LNG facility would be a prime target for those groups of people who want to see a 9/11 type of disaster happening again. An exploding LNG port in our populous metropolitan area would be disastrous for the resulting damage it would cause to our entire region. 5. Notwithstanding terrorists, gas is in itself presents challenges to issues of safety. A small leakage or rupture to a line or valve can have major safety consequences. What if the gas lines from the LNG port to their shore locations rupture from some mechanical or pressure problem and spill into the ocean. What kind of damage can it cause and how easily can a rupture like this be repaired. The BP problem in the Gulf showed that repairs to mechanical systems in the deep sea can be problematic. 6. The construction of new pipe lines will dredge up to 20 miles of sea floor resulting in damage to some areas of prime fishing grounds and fish breeding areas. Super Storm Sandy caused enough damage to sea floor and the resulting dredging needed for beach replenishment due to this storm. More damage to the sea floor is not what we want to see. 7. Instead of reducing the price of natural gas for US citizens, LNG may in fact increase the cost due to the selling of it to foreign markets. Because of the above reasons and more that will be expressed by other groups at this hearing, the NJOA and the JCAA urges Governor Christie to veto this LNG effort. (On November 12th, Governor Cuomo came out against the LNG project, effectively stopping it from going forward. Governor Christie's veto of it is not necessary). There are floating islands of garbage in the world's oceans and are comprised of all kinds of trash, but mostly consisting of plastic. One is estimated to be as big as the continental United States! Plastic takes a long time to decompose and even when it does, the problems don't go away. It simply breaks down into tiny pieces. The debris collects in areas known as gyres. An ocean gyre is a circular ocean current formed by the Earth's wind patterns and the forces created by the rotation of our planet. The area in the center of the gyre tends to be very calm and stable. The circular motion of the gyre draws in debris where it makes its way to the center where it becomes trapped and builds up. The material builds up because much of it is not biodegradable. The largest of these areas is the Great Pacific Garbage Patch, but similar patches can be found in the North and South Atlantic and the Indian Oceans. The North Atlantic Garbage Patch is estimated to be hundreds of miles across in size with a density of 200,000 pieces of debris per square mile! The trash is not like a floating landfill, but like a big bowl of soup flecked with pepper flakes. The pepper flakes are the tiny bits of plastic called microplastic. They block sunlight from reaching plankton and algae below. Plankton and algae form their own nutrients and they are very important in the marine food web chain and turtles, fish and other marine species rely on them for food. If these animals start to die, there will be less food for predator species such as tuna, sharks and whales. Cleaning up marine debris is not easy. Many pieces of trash are the same size as sea animals, so the nets designed to scoop up trash would catch these creatures as well. A workable solution to this problem has yet to be found. (Asbury Park Press, Sept. 5 page E3). Anyone who has dug their toes or fingers in the wet sand at the water's edge has most likely unearthed a sand crab, a.k.a. sand flea or sand mole. These armadillo-shaped creatures are usually no bigger than a thumb and are constant burrowers. Their daily routine is a repetition of rolling in the waves, then frantically digging themselves back under the sand. They can bury themselves in 1.5 seconds! A unique fact about the sand crab is that it cannot move forward or sideway, but only backward! They feed in the swash zone- the area where the waves wash up on the beach. To feed, the crab burrows backward into the sand using rear claws and faces the ocean with their eyes and antennae visible. When a wave flows over them, they uncoil a second feather-like antennae that filters out plankton as their favorite meal. A pacific deep-sea octopus (Graneledone boreopaifica) has been found to have an egg brooding cycle of 53 months - the longest period that any animal is known to protect its eggs. In April 2007, researchers observed a solitary female Graneledone in the Monterey Canyon, off the coast of California guarding a clutch of eggs. The same scientists returned to the site 18 times over the next four and a half-years using a remotely operated vehicle to monitor the octopus and her clutch estimated at 160 eggs. She did not feed while nesting, and her body became pale and slack. Like other octopods, the Graneldone dies after its eggs hatch. The scientists believe that the long brooding cycle may be a reproductive strategy. Laying fewer eggs and guarding them so long allow the babies to grow and fully develop while still in their eggs, giving them the best chance of survival! Nature at its best! (NY Times 8/19/14). about 600 oysters a year! Cheap and abundant, oysters were the pizza slice of the 1800's. For less than a penny apiece. this poor man's dietary staple was sold at countless oyster saloons in lower Manhattan. The happy-hour special - called the "Canal Street Plan"- was all-you-could eat- for a six pence. Pearl Street, near Wall Street in lower Manhattan, is so named because this street was paved with native oyster shells. By 1910, 1.4 billion oysters a year were pulled out of city waters! Since oysters filter water, the increasing pollution in NYC waters began to make people sick and the polluted waters eventually took their toll on the oysters and their life cycle. Several environmental organizations(NY/NJ Baykeeper) are talking about bringing them back with seeding them at various locations, but it would take a lot of seeding and a lot of time to bring them back to the level they once had around New York! need to rebuild with green building solutions, such as pavement that can actually absorb water, rain gardens that can hold and filter water, and even green roofs that capture up to 50 percent of the rain that falls on a building. New Jerseyans have come together for the Shore before. When needles and garbage washed up on our Shore, we demanded and won new laws against coastal pollution. When Washington delayed sending relief after Sandy, we spoke out and Congress responded. Now it's time to stand up for the Shore again. Trenton, NJ – Industrial facilities dumped 8.5 million pounds of toxic chemicals into New Jersey’s waterways, making New Jersey’s waterways the 12th worst in the nation, according to a new report released today by Environment New Jersey. Wasting Our Waterways: Industrial Toxic Pollution and the Unfulfilled Promise of the Clean Water Act also reports that 226 million pounds of toxic chemicals were discharged into 1,400 waterways across the country. The Environment New Jersey report documents and analyzes the dangerous levels of pollutants discharged to America’s waters by compiling toxic chemical releases reported to the U.S. EPA’s Toxics Release Inventory for 2010, the most recent data available. One fish, two fish, bad-for-you-fish. Yes fish, no fish, red fish…OK fish? Our oceans have become so depleted of wild fish stocks, and so polluted with industrial contaminants, that trying to figure out the fish that are both safe and sustainable can make your head spin. "Good fish" lists can change year after year, because stocks rebound or get depleted every few years, but there are some fish that, no matter what, you can always decline. The nonprofit Food and Water Watch looked at all the varieties of fish out there, how they were harvested, how certain species are farmed, and levels of toxic contaminants like mercury or PCBs in the fish, as well as how heavily local fishermen relied upon fisheries for their economic survival. These are the fish, they determined, that all of us should avoid, no matter what. Why It's Bad: Tilapia, Contains Potentially Dangerous Fatty Acid Combination. Farm-raised tilapia, one of the most highly consumed fish in America, has very low levels of beneficial omega-3 fatty acids and, perhaps worse, very high levels of omega-6 fatty acids, according to new research from Wake Forest University School of Medicine. Nearly 90% of the Tilapia imported to the US, where use of antibiotics that are banned in the U.S. Farm-raised tilapia are a diet fishmeal made from Menhaden, Menhaden are the pray fish for many species of fish important to the health of our Atlantic fish population. Eat This Instead: US hook-and-line-caught haddock, Haddock contains 90 calories, 20 grams of protein and .55 grams of fat per 100-gram serving, which is slightly more than 3 ounces. The same amount of cooked tilapia contains 128 calories, 26 grams of protein and 2.65 grams of fat. Haddock has fewer calories and a slightly healthier fatty acid composition. Why It's Bad: Nearly 90% of the catfish imported to the US comes from Vietnam, where use of antibiotics that are banned in the U.S. is widespread. Furthermore, the two varieties of Vietnamese catfish sold in the US, Swai and Basa, aren't technically considered catfish by the federal government and therefore aren't held to the same inspection rules that other imported catfish are. Why It's Bad: This group of fish includes flounder, sole, and halibut that are caught off the Atlantic coast. They found their way onto the list because of heavy Commercial overfishing that dates back to the 1800s. According to Food and Water Watch, populations of these fish are as low as 1% of what's necessary to be considered sustainable for long-term fishing. Why It's Bad: It's actually illegal to capture wild Atlantic salmon because the fish stocks are so low, and they're low, in part, because of farmed salmon. Salmon farming is very polluting: Thousands of fish are crammed into pens, which leads to the growth of diseases and parasites that require antibiotics and pesticides. Often, the fish escape and compete with native fish for food, leading to declines in native populations. Adding to our salmon woes, the U.S. Food and Drug Administration is moving forward with approving genetically engineered salmon to be sold, unlabeled, to unsuspecting seafood lovers. That salmon would be farmed off the coast of Panama, and it's unclear how it would be labeled. Currently, all fish labeled "Atlantic salmon" come from fish farms. Why It's Bad: The biggest problem with imported crab is that most of it comes from Russia, where limits on fish harvests aren't strongly enforced. But this crab also suffers from something of an identity crisis, says Cufone: "Imported king crab is often misnamed Alaskan king crab, because most people think that's name of the crab," she says, adding that she's often seen labels at supermarkets that say "Alaskan King Crab, Imported." Alaskan king crab is a completely separate animal, she says, and it's much more responsibly harvested than the imported stuff. Why It's Bad: Most Chilean sea bass sold in the US comes from fishermen who have captured them illegally, although the US Department of State says that illegal harvesting of the fish has declined in recent years. Nevertheless, fish stocks are in such bad shape that the nonprofit Greenpeace estimates that, unless people stop eating this fish, the entire species could be commercially extinct within five years. Food and Water Watch's guide notes that these fish are high in mercury, as well. Eat This Instead: These fish are very popular and considered a delicacy, but you can get the same texture and feel with US hook-and-line-caught haddock. The Delaware estuary, New Jersey's largest estuary system, is a semi-enclosed body of water where freshwater from the Delaware River mixes with salt water from the Delaware Bay. The estuary is a migratory route for many recreational and commercial fish and provides critical spawning and feeding grounds and nursery areas for many species. The success of a species is contingent upon the survival of their young. The Delaware estuary provides a suitable nursery environment for young fish to grow. Monitoring populations of these juvenile fish is essential for fishery managers to estimate abundance and evaluate the success of the population. These assessments provide a means to predict population trends and future harvest potential of monitored species. Bureau of Marine Fisheries biologists within the New Jersey DEP's Division of Fish & Wildlife conduct several surveys each year to study the status of species populations within the estuary. One of these surveys is the Delaware River Seine Survey. The seine survey is a Fishery Independent Monitoring Project required by the Interstate Fisheries Management Plan for Striped Bass . It is currently the Bureau of Marine Fisheries' longest running fishery-independent survey. It began in 1980 when striped bass stocks were severely depleted and is primarily a juvenile striped bass abundance survey. Data collected provides an annual abundance index for this species, reported as the number of young-of-year per seine haul. Results have been corroborated by other independent surveys, such as the Delaware Division of Fish & Wildlife's striped bass spawning stock survey. A unique aspect of this survey is its longevity - it has been conducted for 32 consecutive years. Data from such a large period of time is highly beneficial to species population studies. Not only does this survey tell us how many fish there are from year to year, but the data also contributes to the development of fisheries management plans and projections of sustainable harvest levels. For more information about the value of this survey, see the article from the 2006 Marine Issue of the Fish and Wildlife Digest: www.njfishandwildlife.com/pdf/2006/digmar28-31.pdf (pdf, 815kb). In the past, anglers and environmentalists were united for common concerns like clean water. This union has been adversely affected by the environmentalists calling for damaging restrictions on how much anglers can catch resulting in many boat captains going out of business. An article in the July 4th edition of the NY Times indicated that a third-generation fisherman from Maine (Captain Robbins) who specializes in catching herring has been at great odds with the environmental lobbyists and really dislikes them because of their promoting catch restrictions on herring. However, he has decided to work with them to stop 30 large boats that use nets as big as a football field to scoop up hundreds of thousand pounds of herring in the Gulf of Maine. Called mid-water trawlers, they account for 98% of the 100,000 tons of herring caught in New England waters. The trawlers appeared in New England waters about 10 years ago and would often come in small areas and fish until they scooped up everything. The locals call it “Localized Depletion”. If the herring is gone, tuna, birds and other fish have nothing to eat and they too are gone. New rules call for observers on these trawlers to monitor their catches and thereby have documentation to determine if herring is being overfished. Captain Robbins is convinced the herring is overfished and he also said that “A lot of times in commercial fishing, there’s a saying: don’t speak against other fishermen. But there’s times where you can’t do that, and this is one of them”. A mysterious fish-kill in Dunkard Creek may have been the result of wastewater from hydraulic fracturing of shale for natural gas.Was it coal miners whose runoff wiped out aquatic life in the stream where locals have long fished and picnicked? Or was it Marcellus Shale drillers and the briny discharge from their wells that created a toxic algae bloom that left a miles-long trail of rotting fish along the West Virginia-Pennsylvania state line?U.S. EPA has ended its investigation and pointed the finger at a local coal mine, Blacksville No. 2, and entered a multimillion-dollar settlement with the owner, Consol Energy Inc. But the lead EPA biologist on the case has challenged that idea, saying that the most likely explanation for the fish kill involves the environmental effects of Marcellus Shale drilling. The Obama administration unveiled long-awaited rules on Friday to bolster oversight on public lands of oil and natural gas drilling using fracking technology that has ushered in a boom in drilling but also triggered environmental protests. Artist Chris Wojcik and his art team built a 47-foot life-like horseshoe crab sculpture that will be placed on the Axel Carlson reef. Wojcik, a scuba instructor and marine biologist from Bay Head, NJ, began building the sculpture to become part of an already existing artificial reef last October. The sculpture, made of reinforced concrete, will sit in 80 feet of water and become home to a variety of marine life. It was supposed to be deployed on the reef on July 25th, but windy weather delayed its deployment. The state Division of Fish and Wildlife is in charge of placing the sculpture on the reef and it announced that the sculpture will deployed in the early part of August, weather permitting. Horseshoe Crab Sculpture Destroyed As reported in our August bulletin, a 47- foot horseshoe crab structure designed by artist Chris Wojcik was to be deployed on the Axel Carlson reef. About 100 people gathered on boats to watch it sink. The sculpture, towed by two barges, reached the designated area and the crews worked to slowly open the hatches of the barge to flood it while the crane workedto hold it level so it could sink properly. However, a rear strap supporting the stern of the barge snapped and the barge and sculpture plunged down to the reef, bow up. The sculpture weighing about 50 tons broke into small pieces on the ocean floor! These pieces will create an artificial reef, but not in the way it was supposed to and the artist who spent so much time and raising a lot of money to build it was very disappointed over this fiasco. soup, the slaughter of sharks for their fins will not end any time soon. The Asian market developed a huge taste for glass eels in our waters for their exotic dishes (barbecued eels and other seafood). The huge pressure on this fishery resulted in the closure of fishing for glass eels that were once abundant during the 1990’s in New Jersey’s waters. Because of their scarcity, juvenile eels fetch $2,500 a Pound and sometime even more! An article in the March 16th edition of the Asbury Park Press reported that three fishermen from Maine came down to Absecon Creek (by Atlantic City) and set a net out early in the morning (2:45 a.m.) of March 13th to catch eels, but were being unknowingly watched by NJ conservation officers. The two men operating the net took about three pounds of glass eels that equals about eight thousand eels. On the shore, the third man from Maine was in a truck with a live holding tank that had another six pounds of eels in it or about 16,000 eels. A catch of 9 pounds of eels would bring about $22,500 for not too much effort and time. They would most likely have been around for more eels if they were not caught for more dollars to their wallets. The three men involved in this illegal activity have a court appearance in Absecon municipal court and face some hefty fines. 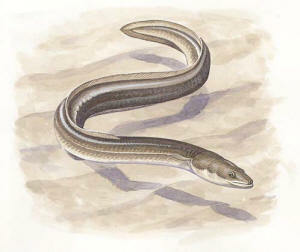 It is amazing that such small eels could be worth $2, 500 a pound! This is probably the most expensive thing that swims in any of our waters on earth!